Mamie Eisenhower with her favorite color of pink showing up frequently in her public wardrobe and in the decor of the private quarters of the White House, she helped to make it a popular color for the early 1950's, one paint company even offering "First Lady Pink" among its pallet. Mamie Geneva Doud Eisenhower (November 14, 1896 to November 1, 1979) was the wife of United States President Dwight D. Eisenhower, and First Lady of the United States from 1953 to 1961. This famous rose plant will bring your family great joy. New growth is burgundy transforming to dark green foliage that is compact with an upright growth habit reaching 3-4 feet in height (3-4 feet in width). Wonderful Gift Idea for Mother's Day, Birthdays, or as corporate gifts. 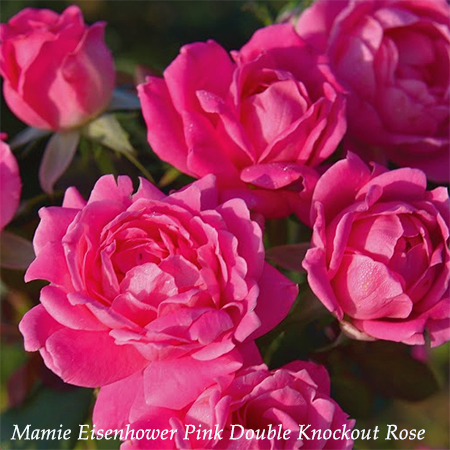 Nancy Reagan Red Double Knockout Rose can be used as an specimen, accent, hedge, and foundation plant.